Once there was an man, who wasn't yet an uncle. He was a brother who had gone to study in England. His two sisters missed him a lot, but they kept in touch by writing (this wasn't yesterday. No email); and, every so often, they begged a couple of days off from their very first jobs and they went to visit. That way, they could sleep on the floor in a room in Halls and pretend to be students again and have the treat of going to Formal Dining and an end-of-term revue. 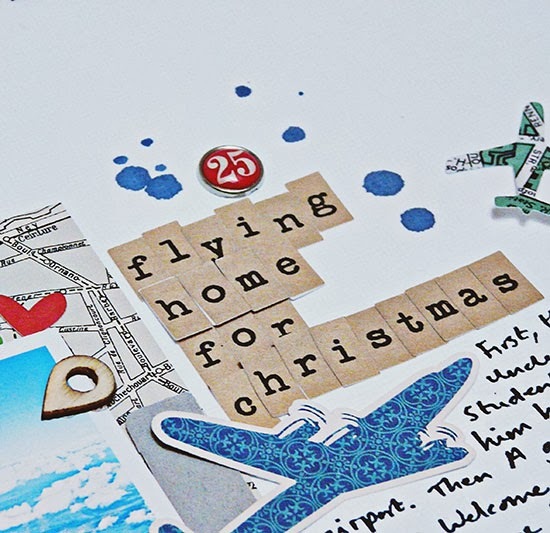 Every Christmas they worked out between them who would get up early to go to the airport to bring him home for Christmas; and they counted the days. There was only one year, back then, when he didn't make it back. It's a long way from Taipei. But, to make up for it, he came home early in the New Year, in time for his nephew's birthday. Because by then he had a nephew and the little boy who knew to call him uncle was a big fan. One of his favourite toys was a photo album about the uncle who lived far away, and one of his favourite outings was a trip to the airport to bring Uncle Dave home. When he was big enough he made a banner "Welcome Home", to hold up so that Uncle Dave could see him; and then, suddenly one year, he was old enough to lift a suitcase and say I'll carry that, in his new teenage voice. And, as he grew, Uncle Dave kept on flying home for Christmas. Of course, the boy kept on growing until, at last, he was big enough to leave home and follow his dream of studying Law. He wanted to be a student and live in Halls and enjoy end-of-term parties too. He went to Scotland and - well, you know what that means: for the first time this year we have two men flying home for the holidays. You can guess how it goes, though. Counting the days, piling into the car, thinking about a banner.. The student (and his new student beard! and his stories!) got here on Thursday, to be welcomed by a sister of his own, and his uncle arrives tomorrow. We are all looking forward to it. The other sister? Well, she has a little boy of her own now - and you know who that is: Uncle Dave has another small fan waiting not so patiently for his arrival. Hold tight, Little E! The big boys are coming home and we'll all see you very soon. We're hoping for a Merry Christmas. That choked me up! What a beautiful way to describe your relationships. Just print that out and give it to Uncle Dave. I'll bet that's all he needs for Christmas! I hope you have a very Merry Christmas with all your family! With all your family surrounding you, I'm sure it will be very merry! Blessings! Enjoy it all. What a lovely story. Make the most of every minute of having all those boys/men home for Christmas! Oh so glad the student (and his beard) have returned home. Hope you all have a wonderful festive season w Uncle Dave. I am glad I am not the only one with tears in their eyes. I had put it down to pre-Christmas exhaustion but really it is your fabulous story telling. Wishing you a very merry Christmas and hope you have a wonderful time with your boys and the NSSO. Just beautiful ... You write from the heart. Happy for you. Enjoy your family Christmas with everybody home. I loved this post Sian. Your writing is always so wonderful to read. Have a wonderful holiday with all of your family together. Your page is lovely with that awesome banner. So wonderfully told! So glad y'all will all be together for Christmas - enjoy!!! Merry Christmas! What a lovely story, especially about how your big boy and his younger cousin react the same way to Uncle Dave (and, of course, the admiration of the younger cousin for the older one). You've managed to capture in this post one of the best aspects of the holiday season, anticipation, in its very best form--of looking forward to being with the people we love. Thanks for sharing! 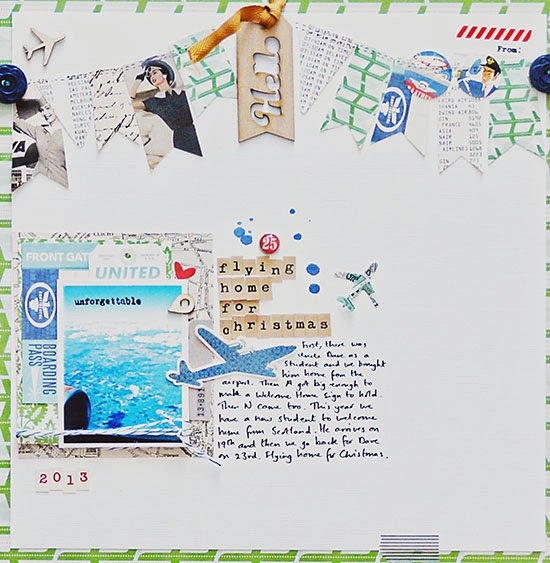 Such a fantastic story to share at Christmastime, Sian, and I LOVE the layout you've made to go with it. What a lovely story Sian and the perfect layout for it. I hope you and your family are having a wonderful Christmas season. As always, beautifully told and such a special one to record. I hope all of you had a wonderful Christmas and Boxing Day and that the "boys" are home for a bit. Loved this story and loved this page. I'm another who had a lump in her throat as she was reading! I don't know what I adore more - the layout or your writing today Sian! I love the design and details of they layout and how you capture the circle of life in your writing. So happy to have my own boy home this holiday.